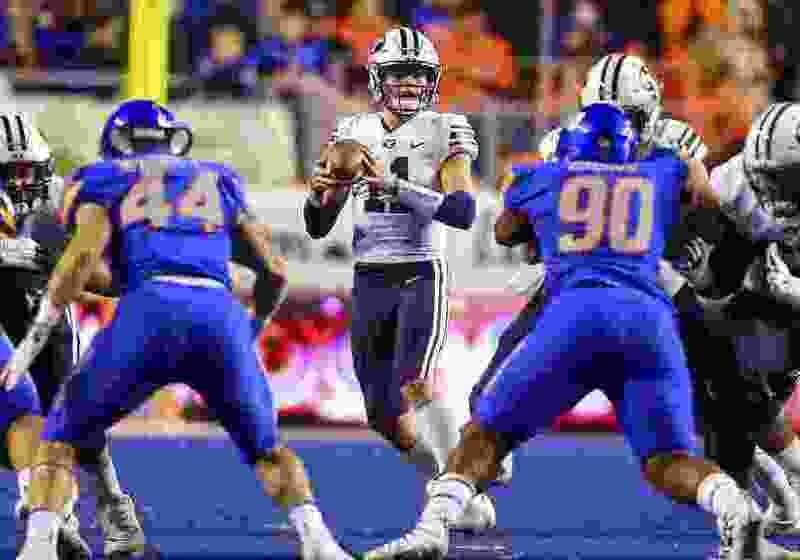 Provo • A lot of coulda, woulda and shoulda will accompany descriptions of BYU’s 2018 football season when all is said and done, particularly when the losses to California, Northern Illinois and Boise State are analyzed. For instance, if the Cougars could have done more in the red zone against those three opponents, they would have been 7-2 instead of 4-5 and should have been talking about what bowl game they were going to rather than the need to defeat Massachusetts on Saturday (10 a.m. MST, Ch. 11) at Gillette Stadium in Foxborough, Mass., to keep their postseason hopes alive. “We’ve just got to find a way to get the ball in the end zone,” coach Kalani Sitake said Monday. Of course, never has that been more apparent than the closing seconds of Saturday’s 21-16 loss to Boise State. After Matt Hadley took a screen pass 59 yards to the BSU 24, the Cougars ran eight plays (one was a spike to kill the clock) without scoring, including the sack of quarterback Zach Wilson on the 4-yard line that ended the game. BYU moved the ball inside the BSU 20-yard line six times, but scored just one touchdown — a 4-yard run by Wilson — and two field goals. Their other field goal came when a 12-play drive stalled at the 25. Aside from that memorable failure in the 21-18 loss to Cal when Dayan Ghanwoloku jumped on a muffed punt at the Bears’ 16 and Tanner Mangum threw an interception three plays later, BYU was mostly successful in the red zone in its first seven games. Not counting drives that ended in kneel-downs, BYU scored 18 touchdowns and three field goals in 23 red-zone possessions in its first seven games. That’s a 78.3 percent success clip. In its last two games, though, BYU has scored one touchdown on eight possessions in the red zone (including Matt Bushman’s lost fumble at the BSU 3 after catching a 40-yard pass from Neil Pau’u). It has settled for field goals four times — two each against NIU and Boise State. Sitake said it was offensive coordinator Jeff Grimes’ own decision to move from the sidelines to the booth in the press box for the Boise State game, and Sitake didn’t think the move had anything to do with the red-zone failures Saturday. Grimes said on his Coordinators’ Corner program Monday that he isn’t sure yet where he will be in the next three games — at UMass Saturday, at home against New Mexico State on Nov. 24 (8:15 p.m.) or at Utah on Nov. 24 (kickoff time TBA). “We are just going through some growing pains, and part of that is our red-zone offense and part of it has been pass protection, and part of it has been not being efficient in the run game,” Grimes said, alluding to the starting quarterback change made three weeks ago before the 49-23 win over Hawaii. Another problem for the BYU offense: third-down conversions. The Cougars are 120th in the country, of 129 teams, on third down, having converted just 33 percent of the time (38 of 115). Last season, their third-down conversion rate was 35.8 percent, which ranked them 95th in the country.